We’d love your help. Let us know what’s wrong with this preview of Doing Happiness by Robert Hawke. 60% of happiness is not up to us. This book is about the other 40%. 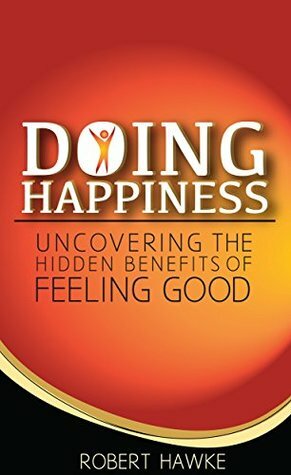 "Doing Happiness: Uncovering The Hidden Benefits of Feeling Good" reveals the simple but profound techniques that are scientifically proven to help you be happier everyday. You'll also learn how "Doing Happiness" will make your work easier, improve your health and enrich your relationships. Doing Happiness c 60% of happiness is not up to us. This book is about the other 40%. Find ways to be happier now. Use happiness as a way to improve productivity. Develop a happiness blueprint to build good feelings into your life. Use your body to create happiness from the "outside in". Learn how being happy helps those you care about the most. To ask other readers questions about Doing Happiness, please sign up. Easy read full of pragmatic advice on how to do happiness every day. As the title suggests, Robert approaches happiness as an activity rather than an end goal and provides a smorgasbord of happiness increasing options for the reader, all supported by research. This book is a great reminder to do the little things that make life great. I've already caught myself starfishing before meetings and dancing in the elevator. This book is awesome. In a very light and humourous style, Hawke tells us how we can be happier on a day to day basis. Not only is this book easy to read its also very useful. I wish I had known about this stuff years ago. It would have made things a lot better. Many thanks!! There have been many books about happiness and how to achieve it, but this author doesn't only tell us that we should be happy, he tells us 'why' and backs it up with evidence (all the while keeping it an easy and fun read). I got three main things out of this book: (1) Happiness is not just an end in itself, it is also a means to other ends - like health and productivity; (2) It's not just about 'being' happy, it's about DOING happiness. It reminds me that I have things I can control and manage There have been many books about happiness and how to achieve it, but this author doesn't only tell us that we should be happy, he tells us 'why' and backs it up with evidence (all the while keeping it an easy and fun read).